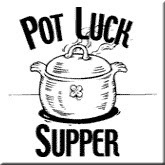 Welcome to the Leap Day Edition of the Teacher's Pot Luck Carnival! According to folklore "Leap year was ne'er a good sheep year." That's OK because we are presenting a (mostly) vegetarian potluck. In case you have the cold or flu, we also have a healthy recipe for herbal cough drops and throat soothers. Did you know that there are only twenty more days left until spring? We had a foot of snow this weekend here in Vermont. Tonight and tomorrow we are getting another foot. But here at the Teacher's Pot Luck Carnival, it's warm by the stove! VERMONT BAKED BEANS: I've been experimenting with baked bean recipes (not vegetarian). I think I've finally got it right. They come out differently each time, which makes Saturday's bean supper always an adventure! Vermont Baked Beans are mild and use maple syrup, not molasses. You can substitute, though, if you are devoted to molasses. Michael has a great vegetarian casserole, World's Fair Vegetable Rice, that came from his Boy Scout manual back in the days. It's a one or two pot meal made for campers and great for a potluck. He has also contributed a great peach cobbler recipe, Michael's Peach Cobbler, made on the stove top. Did you know that King Arthur Flour is based right here in Norwich, Vermont? It's our favorite store. They have started a blog, too. It's full of recipes, tips and tricks for professional and home baking. Amelia and I collect their recipes on my recipe blog. Amelia and I are sending two bread recipes that become four. Change the molasses for maple syrup in both recipes and you get a completely new taste! 100% Whole Wheat Bread is a King Arthur Flour recipe that I have worked with for over a year. Try it! Amelia has been working with King Arthur's Oatmeal Sandwich Bread. I prefer the maple oatmeal. She prefers the molasses. Baldwin's Girl, a well-known train photographer, had the flu and had it rather badly. Luckily for us, she posted her recipe for Herbal Cough Drops and Throat Soothers. I am definitely going to make these if I get sick this winter. As an added bonus, you can use the same recipe for an herbal hand/air/room/surface spray (lavender, please, for me!). You probably don't have all of the ingredients on hand, so plan ahead, visit her post, make a shopping list, and stock up! Continuing her Web 2.0 series, Mrs. Whatsit shares Mind Maps and Social Software. I can see our teachers moving towards Web 2.0, but it's going to be quite a long time before we implement it as well as Mrs. Whatsit. It's a shame we don't move faster, because Mrs. Whatsit's students seem very involved in their learning. Larry Ferlazzo sent Stadium Nutrition from Aetna — an interactive exercise where you create a meal you’d eat at a baseball stadium and you’re then told its nutritional content. I played with this and you have to go see the nutritional content of stadium peanuts. Yuck! But fun! Colleen Palat at tutorfi.com has submitted Handling the Student with Difficult Behaviors, a problem we are all having with disturbing frequency. I am going to print her list of seven tips. The more we read them the more we will internalize them and can therefore avoid problems in the future. That's it for this Teacher Potluck Carnival. I hope you enjoyed it and found lots of great food and useful information. My thanks to Michael for teaching me how to fix the Potluck Carnival's graphic so that it looks good on my blog! On March 14, the Pi Day Edition of the Potluck will go up here at meeyauw. Be sure to e-mail me with your submissions. Look at the top of the right sidebar and click for email. March 14 is the day we celebrate that wonderfully irrational number, pi. So let's see lots of pis and St. Patrick's Day recipes! I already know what I'm going to submit! Link up and spread the word! Pi Day! So that's why you picked that date. Guess I'm going to have to unearth another quiche recipe....that does qualify as pie, doesn't it? Thanks for taking this on. You do a fantastic job! Nerd Shots: "Total Lunar Eclipse"
Cats Tuesday: Love No More?